The conclusion of this paper is completely opposite to the consensus of the academic community. … the journal did not forward any evidence that there is an error in my paper and did not acknowledge that my paper proves the “consensus” is wrong. 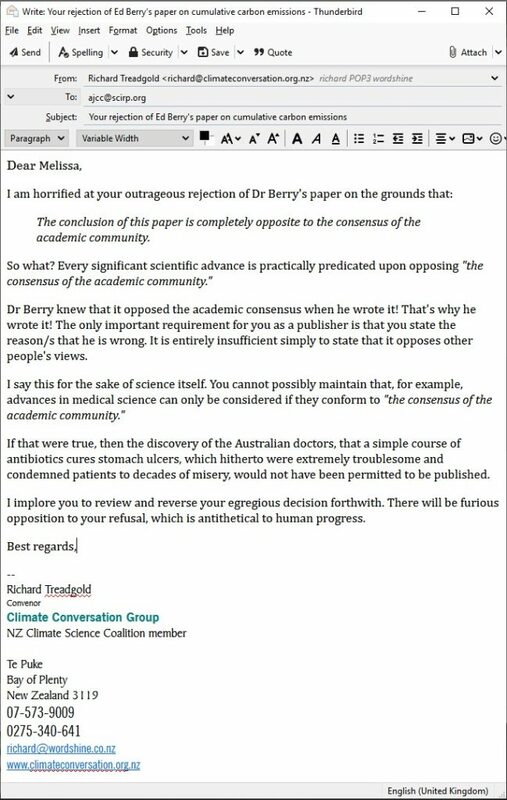 So, if it is unacceptable to publish a paper that contradicts the “consensus” how can there be progress in science? The paper remains unpublished, but Ed makes his journal submission available on his website. PLEASE NOTE that Ed cautions readers: Copyright does not allow republishing of journal submissions. Therefore I will not republish the paper here until it’s publicly available, in case I deter other journals from accepting it. You can of course read Ed’s copy. I emailed the editor at AJCC. 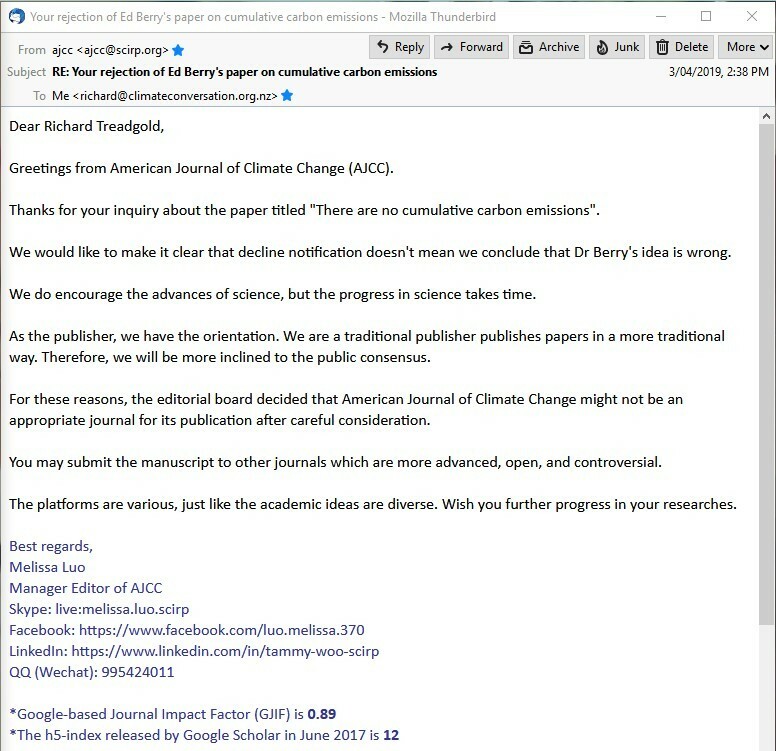 For the editor of an academic journal she writes a disorderly letter, descending in parts to sheer incoherence, and though she reassured Dr Berry they don’t consider his idea wrong, in declining to publish the paper the editorial board firmly prevented any potential review of it, and whatever they thought of Ed’s idea became irrelevant. Ed has already submitted the paper elsewhere, and we wish him luck. Like it, like the Salby approach. It IS simple Physics, as with the basic atmospheric science of Ideal Gas Laws, Equipartition of Energy, convective and Latent Heat transport, Gravito Thermal Effect, Henry’s Law of solvency that make it so. Needs feet on the ground and eyes to see though…….. Thanks Ed from Brett Keane; h/t to RT.